Longtime Seed Savers Exchange member Amy Frances LeBlanc owns Whitehill Farm in East Wilton, Maine. She grows a large variety of tomatoes and peppers, and prepares value-added goods such as hot sauce, jams, and herb mixes. She also lists rare seeds on the Exchange each year. What does it mean for Seed Savers Exchange to be a member-supported nonprofit? You probably think first of the annual donation a member may make to the organization, but there are many ways Seed Savers Exchange members have not only contributed to the organization, but also impacted the heirloom seed movement in their own communities. Amy Frances LeBlanc, a SSE member since 1996, truly embodies the mission of SSE to promote and preserve our garden heritage. Amy first became interested in growing heirloom varieties shortly after moving to East Wilton, Maine, in 1986. A routine trip to the local health foods store led to the discovery of the first heirloom tomato Amy had ever seen, the ‘Hog Heart’ paste tomato. She spent the next year searching for the grower of this tomato. It turned out to be Martha Gottlieb, also a longtime Seed Savers Exchange member. Martha convinced Amy to participate in the Exchange, where she would be able to find more tomatoes than she could possibly grow. 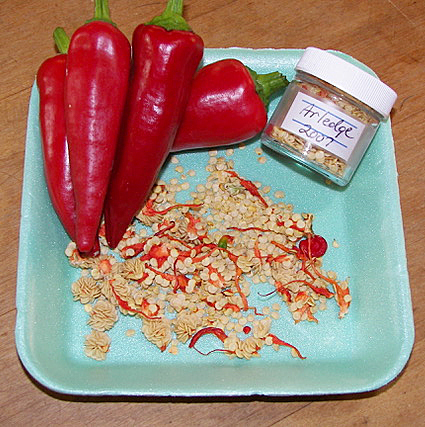 The ‘Arledge’ pepper, also known as ‘Louisiana Hot,’ is one of Amy’s favorite hot peppers. This pepper is no longer available through the commercial seed trade, and Amy is the only grower currently offering it on the Exchange. Amy published the “Tomato Lover’s Catalog” for 25 years. This catalog catalyzed the heirloom tomato movement in Maine and helped to preserve hundreds of varieties for future generations. The Exchange introduced her to many of the varieties she grew and sold through her catalog and market stand. Amy has also been able to preserve heirlooms that had previously been stewarded by individual families by offering them through the Exchange or making a donation to our collection. For example, ‘Cecil’s Grandpa’s’ tomato was given to her by a cello student, Cecil, whose grandfather had been growing the tomato for more than 35 years. Her seed donations for the ‘Baxter Large Red Cherry’ tomato, which Amy describes as “the best lunchbox tomato ever,” and the ‘Tennessee Sweet’ tomato were first entrusted to Amy by neighbors. One of her favorite peppers—’Arledge’—is no longer available commercially, but thankfully Amy still offers it through the Exchange. Amy always encourages curiosity at her Whitehill Farm; this fruit was grown by her students last year from a pineapple top. Amy has influenced the next generation of consumers and gardeners in ways that only a teacher can. She spent 17 years teaching in public and private schools and now offers private music lessons. Amy’s farm is completely youth-operated, and many of her “kids” started working on the farm while they were taking music lessons. Young people on the Whitehill Farm are involved in everything from selecting varieties to grow and writing requests to Exchange listers to building new garden beds, giving farm tours, handling money at the farmers market, and saving seeds. Of the students who have worked on Amy’s farm, seven are now operating their own farms, and many others are gardeners. All have learned about being more conscious eaters, even if they don’t realize it. “It gives them a different attitude about going to the grocery store,” Amy says.